For more on these rules, see Publication 526, Charitable Contributions. Get it on IRS.gov/forms at any time. Order online. Use the ‘Get Transcript’ tool available on IRS.gov. There is a link to it under the red TOOLS bar on the front page. Those who use it must authenticate their identity using the Secure Access process. 1- In 1984, President Ronald Reagan decreed that July would be National Ice Cream Month. And on the third Sunday of July—yes, that’s today—we celebrate National Ice Cream Day. 2- The sound of the ice cream truck is a trademarked sound: On May 21, 2013 the Australian company Breville received the trademark for the sound the ice cream truck makes, which they described as follows: The mark consists of the song “Turkey in the Straw”, which consists of a keyboard synthesizer playing pickup measure: G4 eighth note followed by F4 eighth note; first measure: E-flat4 quarter note followed by E-flat4 eighth note followed by F4 eighth note followed by E-flat4 eighth note followed by B-flat3 eighth note followed by G3 eighth note followed by B-flat3 eighth note, played simultaneously with E-flat3 half note followed by B-flat2 half note; second measure: E-flat 4 eighth note followed by C5 eighth note followed by B-flat4 eighth note followed by G4 eighth note followed by B-flat4 quarter note followed by E-flat4 eighth note followed by F4 eighth note, played simultaneously with E-flat3 half note followed by B-flat 2 half note; third measure: G4 quarter note followed by G4 quarter note followed by G4 eighth note followed by F4 eighth note followed by E-flat 4 eighth note followed by F4 eighth note, played simultaneously with E-flat3 half note followed by B-flat 2 half note; fourth measure: G4 quarter note followed by F4 quarter note followed by F4 quarter note followed by G4 eighth note followed by F4 eighth note, played simultaneously with B-flat2 half note followed by F3 half note; fifth measure: E-flat4 quarter note followed by E-flat4 eighth note followed by F4 eighth note followed by E-flat4 eighth note followed by B-flat3 eighth note followed G3 eighth note followed by B-flat3 eighth note, played simultaneously with E-flat3 half note followed by B-flat2 half note; sixth measure: E-flat4 eighth note followed by C5 eighth note followed by B-flat4 eighth note followed by G4 eighth note followed by B-flat4 quarter note followed by E-flat4 eighth note followed by F4 eighth note, played simultaneously with E-flat3 half note followed by B-flat2 half note; seventh measure: G4 eighth note followed by B-flat4 eighth note followed by eighth rest followed by C5 eighth note followed by B-flat4 eighth note followed by G4 eighth note followed by E-flat4 eighth note followed by F4 eighth note, played simultaneously with B-flat2 quarter note followed G3 quarter note followed by B-flat3 half note; eighth measure: G4 quarter note followed by F4 quarter note followed by E-flat4 quarter note followed by quarter rest, played simultaneously with B-flat2 half note followed by E-flat2 half note. 3- Around 1832, Augustus Jackson created multiple ice cream recipes and pioneering a superior ice cream preparation technique and decoration. 4- Nancy Johnson of Philadelphia created the hand-cranked device that was the first ice cream machine in 1843. This revolutionizing the distribution and sale of ice cream throughout the United States and Canada. It was a manual device cranked by a handle with a pewter cylinder. 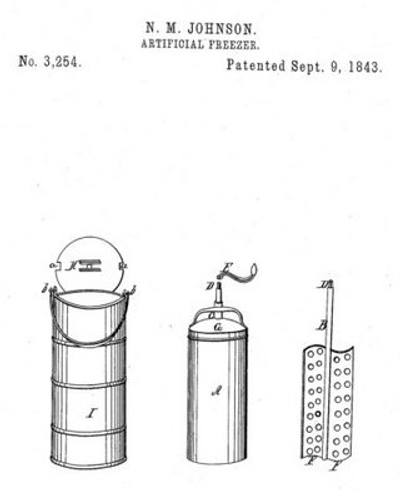 Her invention, as illustrated in her patent no. 3,254 looked like the diagram below and was described as: An outer wooden pail contained crushed ice; an inner tin or pewter cylinder contained the ice-cream mix to be frozen. A manual device cranked by a handle with a lid bolted on and the handle inserted through the top of the lid and turned to freeze the mix. The device inside attached to the handle was called a dasher. It was possible to split the inner cylinder such that 2 different ice cream flavours could be frozen simultaneously but separately. 5- Syrian immigrant and waffle salesman Ernest Hamwi has generally been credited with inventing the first edible ice cream cone at the 1904 St. Louis World’s Fair when a nearby vendor ran out of serving dishes, and the creation sparked a nationwide sensation. 6- Philadelphian entrepreneur by the name of Robert Green would regularly mix syrup and cream into his carbonated beverages in the last decades of the 1800s. Legend has it that on one fateful day, he ran out of these regular ingredients and used ice cream as a substitute, creating the first ice cream soda in the process. 7- The Oregon Research Institute in Eugene and published a study in the American Journal of Clinical Nutrition that found that when the brain craves ice cream and other high-fat/high-sugar foods, it reacts in the same way as a cocaine user’s does in a period of withdrawal. 8- In 2012, after an exhaustive survey of regional credit card transactions throughout the nation, researchers found that “Long Beachers eat ice cream a whopping 268 percent more than the average American.” Fort Worth and Dallas also scored well above average when it comes to devouring ice cream. 9- Prior to the invention of refrigeration, ice cream was a rather expensive dessert. Our nation’s first president is rumored to have once spent $700 on the delicacy in New York City over the course of one summer. Sharing her husband’s zeal, Martha Washington acquired a “cream machine for ice” in 1784 to serve ice cream to her guests at Mount Vernon. 10- Ben And Jerry wanted to buy a bagel machine but could only afford an ice cream maker, thus was born their famous ice cream. Go get yourself some ice cream! Happy National Ice Cream Day 2017! SACRAMENTO, Calif. – Director Tanya N. Garfield of the U.S. Small Business Administration’s Disaster Field Operations Center-West today reminded Arkansas private nonprofit organizations of the Aug. 14, 2017, deadline to apply for an SBA federal disaster loan for property damage caused by severe storms, tornadoes, straight-line winds and flooding that occurred April 26 – May 19, 2017. Private nonprofits that provide essential services of a governmental nature are eligible for assistance. In addition, SBA offers Economic Injury Disaster Loans to help eligible private nonprofits meet working capital needs caused by the disaster. Economic Injury Disaster Loans may be used to pay fixed debts, payroll, accounts payable and other bills that cannot be paid because of the disaster’s impact. Economic injury assistance is available regardless of whether the private nonprofit suffered any property damage. Private nonprofits have until March 15, 2018, to apply for an SBA Economic Injury Disaster Loan. SBA low-interest federal disaster loans are available in Baxter, Benton, Boone, Carroll, Clay, Cleburne, Conway, Craighead, Cross, Faulkner, Independence, Izard, Jackson, Lawrence, Madison, Marion, Mississippi, Montgomery, Newton, Ouachita, Perry, Poinsett, Prairie, Randolph, Saline, Washington, White and Woodruff counties. The interest rate is 2.5 percent with terms up to 30 years. Loan amounts and terms are set by SBA and based on each applicant’s financial condition. Posted on July 14, 2017 by ipconcerns Tagged Gene SimmonsHand Gesturetrademark	CommentsNo Comments on Devil Horns Gesture Trademarkable? In the past few months, Gene Simmons, of the famed rock n roll band Kiss, has applied for a number of trademark applications. Simmons, one of the most successful musician-entrepreneurs in history, owns a number of other trademark registrations through his Gene Simmons Company. The most notable of his recent filings is for the hand gesture shown below. This application was filed June 9, 2017 claiming it was for live performances by a musical artist; personal appearances by a musical artist, which has first been used in 1974 . Simmons claimed that it became a part of the band’s act during its Hotter Than Hell tour — on Nov. 14, 1974 to be exact. At the time of the filing, it was controversial as to whether Simmons was the owner of the hand gesture, as it is not only an international symbol of rock, but a perusal of photographs that predate 1974 show other rock stars using the gesture. This is now a moot point as on June 20, 2017, less than 2 weeks after the filing, Simmons filed an express abandonment of the mark. It appears that he sought registration of the hand gesture itself, rather than an image or depiction of the gesture, describing the mark in the application as “a hand gesture with the index and small fingers extended upward and the thumb extended perpendicular.” While images or stylized drawings of hand gestures can function, and be registered as trademarks, either by themselves or as part of a design mark, hand gestures in and of themselves cannot function as trademarks. Even if they could be registered as a trademark, how would one enforce such a thing against others? That would be virtually impossible. Nice try, Gene, but no go.